Rock n Roll Revolution Mojo. 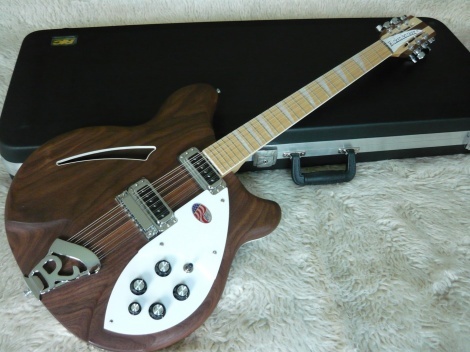 2014 Rickenbacker 360/12 String semi-acoustic Natural Walnut. Brand new, 100% mint, genuine USA and hot off the press. Tom Petty, Beatles and the Byrds to name only a few rock stars to choose the jangling sound of Rickenbacker. Rickenbacker have always been careful not to change much to the formulas that make their guitars iconic in sound and design. They rarely bring anything new to market. However, this year they just could not resist introducing the W Series of walnut made designs. These walnut Rickenbackers boast the same full, rich and warm sounds that they are known for, while adding the strength and natural character of walnut polished with an oil finish. They are outfitted with Maple necks and are made from top quality wood to deliver mojo excellence and vintage vibe.